Fludrocortisone, sold under the brand name Florinef among others, is a corticosteroid which is used to treat adrenogenital syndrome, postural hypotension, and adrenal insufficiency. In adrenal insufficiency it is generally taken together with hydrocortisone. It is taken by mouth. The medication is most commonly used in its acetate form. Common side effects include high blood pressure, swelling, heart failure, and low blood potassium. Other serious side effects include low immune system function, cataracts, muscle weakness, and mood changes. It is unclear if use during pregnancy is safe for the baby. Fludrocortisone is mostly a mineralocorticoid; however, also has glucocorticoid effects. Fludrocortisone was patented in 1953. It is on the World Health Organization's List of Essential Medicines, the most effective and safe medicines needed in a health system. In the United Kingdom it costs the NHS about 1.52 pounds per month. In the United States the wholesale cost of a month of medications is about $11.96. Fludrocortisone is also a confirmation test for diagnosing Conn's syndrome (aldosterone producing-adrenal adenoma), the fludrocortisone suppression test. Loading the patient with fludrocortisone would suppress serum aldosterone level in a normal patient, whereas the level would remain elevated in a Conn's patient. The fludrocortisone suppression test is an alternative to the NaCl challenge (which would use normal saline or NaCl tablets). Fludrocortisone is a corticosteroid and acts as a powerful mineralocorticoid along with some additional but comparatively very weak glucocorticoid activity. Relative to cortisol, it is said to have 10 times the glucocorticoid potency but 250 to 800 times the mineralocorticoid potency. Fludrocortisone acetate is a prodrug of fludrocortisone, which is the active form of the drug. Plasma renin, sodium, and potassium is checked through blood tests in order to verify that the correct dosage is reached. Fludrocortisone, also known as 9α-fluorocortisol (9α-fluorohydrocortisone) or as 9α-fluoro-11β,17α,21-trihydroxypregn-4-ene-3,20-dione, is a synthetic pregnane steroid and a halogenated derivative of cortisol (11β,17α,21-trihydroxypregn-4-ene-3,20-dione). Specifically, it is a modification of cortisol with a fluorine atom substituted in place of one hydrogen atom at the C9α position. Fluorine is a good bioisostere for hydrogen because it is similar in size, with the major difference being in its electronegativity. The acetate form of fludrocortisone, fludrocortisone acetate, is the C21 acetate ester of fludrocortisone, and is hydrolyzed into fludrocortisone in the body. Fludrocortisone was described in the literature in 1953 and was introduced for medical use (as the acetate ester) in 1954. 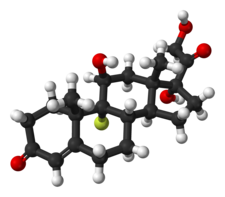 It was the first synthetic corticosteroid to be marketed, and followed the introduction of cortisone in 1948 and hydrocortisone (cortisol) in 1951. Fludrocortisone was also the first fluorine-containing pharmaceutical drug to be marketed. Fludrocortisone is the generic name of fludrocortisone and its INN, USAN, BAN, DCF, and DCIT, whereas fludrocortisone acetate is the generic name of fludrocortisone acetate and its USP, BANM and JAN.
Fludrocortisone is marketed mainly under the brand names Astonin and Astonin-H, whereas the more widely used fludrocortisone acetate is sold mainly as Florinef but also under several other brand names including Cortineff, Florinefe, and Fludrocortison. Fludrocortisone is marketed in Austria, Croatia, Denmark, Germany, Luxembourg, Romania, and Spain, whereas fludrocortisone acetate is more widely available throughout the world and is marketed in the United States, Canada, the United Kingdom, various other European countries, Australia, Japan, China, Brazil, and many other countries. ^ a b c d e J. Elks (14 November 2014). The Dictionary of Drugs: Chemical Data: Chemical Data, Structures and Bibliographies. Springer. pp. 558–. ISBN 978-1-4757-2085-3. Archived from the original on 5 November 2017. ^ a b c d e f g Index Nominum 2000: International Drug Directory. Taylor & Francis. 2000. pp. 450–. ISBN 978-3-88763-075-1. Archived from the original on 2017-11-05. ^ a b c d e f "Fludrocortisone Acetate". The American Society of Health-System Pharmacists. Archived from the original on 5 July 2017. Retrieved 8 December 2016. ^ Richard O. Day; Daniel E. Furst; Piet L.C.M. van Riel; Barry Bresnihan (30 May 2010). Antirheumatic Therapy: Actions and Outcomes. Springer Science & Business Media. pp. 21–. ISBN 978-3-7643-7726-7. Archived from the original on 5 November 2017. ^ "Fludrocortisone Use During Pregnancy | Drugs.com". www.drugs.com. Archived from the original on 24 December 2016. Retrieved 24 December 2016. ^ Fischer, Janos; Ganellin, C. Robin (2006). Analogue-based Drug Discovery. John Wiley & Sons. p. 484. ISBN 9783527607495. Archived from the original on 2017-11-05. ^ British national formulary : BNF 69 (69 ed.). British Medical Association. 2015. p. 494. ISBN 9780857111562. ^ "NADAC as of 2016-12-21 | Data.Medicaid.gov". Centers for Medicare and Medicaid Services. Archived from the original on 24 December 2016. Retrieved 24 December 2016. ^ Taplin CE, Cowell CT, Silink M, Ambler GR (December 2006). "Fludrocortisone therapy in cerebral salt wasting". Pediatrics. 118 (6): e1904–8. doi:10.1542/peds.2006-0702. PMID 17101713. ^ Freitas J, Santos R, Azevedo E, Costa O, Carvalho M, Falcão de Freitas A (2000). "Clinical improvement in patients with orthostatic intolerance after treatment with bisoprolol and fludrocortisone". Clinical Autonomic Research. 10 (5): 293–299. doi:10.1007/BF02281112. ^ a b De Groot LJ, Chrousos G, Dungan K, Feingold KR, Grossman A, Hershman JM, Koch C, Korbonits M, McLachlan R, New M, Purnell J, Rebar R, Singer F, Vinik A, Chrousos, Pavlaki AN, Magiakou MA (2000). "Glucocorticoid Therapy and Adrenal Suppression". PMID 25905379. ^ a b Thomas L. Lemke; David A. Williams (2008). Foye's Principles of Medicinal Chemistry. Lippincott Williams & Wilkins. pp. 890–. ISBN 978-0-7817-6879-5. Archived from the original on 2017-11-05. ^ a b Polito A, Hamitouche N, Ribot M, Polito A, Laviolle B, Bellissant E, Annane D, Alvarez JC (2016). "Pharmacokinetics of oral fludrocortisone in septic shock". Br J Clin Pharmacol. 82 (6): 1509–1516. doi:10.1111/bcp.13065. PMC 5099539. PMID 27416887. ^ a b CALVERT DN (1962). "Anti-inflammatory steroids". Wis. Med. J. 61: 403–4. PMID 13875857. ^ William Andrew Publishing (22 October 2013). Pharmaceutical Manufacturing Encyclopedia, 3rd Edition. Elsevier. pp. 1642–. ISBN 978-0-8155-1856-3. Archived from the original on 5 November 2017. ^ Khan MO, Park KK, Lee HJ (2005). "Antedrugs: an approach to safer drugs". Curr. Med. Chem. 12 (19): 2227–39. doi:10.2174/0929867054864840. PMID 16178782. ^ Walker MC, Chang MC (2014). "Natural and engineered biosynthesis of fluorinated natural products". Chem Soc Rev. 43 (18): 6527–36. doi:10.1039/c4cs00027g. PMID 24776946.